Many homeowners today, especially those who are leery of using chemical herbicides, adopt a tolerant approach toward weeds. But not all weeds are created equal. Japanese knotweed (Polygonum cuspidatum) is one weed that you might want to make a concerted effort to get rid of, since it has been known even to bring down property values (in the U.K.). You can take organic weed-control measures to deal with Japanese knotweed to some degree (such as choking it out with tarps), but you have a better chance of getting rid of this menace if you compromise and supplement such efforts with the occasional use of an herbicide. Be forewarned that this is a multi-year project (but the results will be worth it). Cut all of the Japanese knotweed plants down to the ground. Remove as many sharp objects from the area as possible, including the cut stumps. Spread a covering over the area such that the ground underneath will be deprived of sunlight and water, as will newly emerging Japanese knotweed. Weigh down the covering so that it does not blow, and cover it with mulch to keep your yard aesthetically pleasing. You can even install some lawn ornaments and container gardens to dress up the area further. Or even place a raised bed garden right over it and plant away! It need not be a wasted space in the landscape. Spray any shoots that eventually pop up outside of the covered area with herbicide. Pond liners: Most pond liners are not tough enough to hold up to these conditions. When you cut the Japanese knotweed down to the ground, some sharp edges will inevitably be left over, despite your best efforts to remove them. These will puncture the pond liner, especially after the cut canes dry out and become woody. Newspaper: Newspaper is effective for killing grass, but it is not nearly tough enough for choking out Japanese knotweed. Tarps are a great choice, and they are widely available at not only home improvement stores but also discount stores. In addition to tarps, people also use old carpeting to kill Japanese knotweed by choking it out. This material is tough enough that there is little possibility of its being punctured. It also offers the benefit of being free, as it is something you would be recycling. Do not take the advice to choose a strong material lightly. Besides the immediate threat of puncturing from sharp objects, there is also a longer-term concern: As the next crop of Japanese knotweed emerges from the ground (which it will, despite being deprived of sunshine and water), it will push up against the covering. At first, this will not be an issue. But as the Japanese knotweed stalks age, they will get woody. When they get woody, they break and become sharp. Even if all goes as planned, Japanese knotweed may send up shoots (from its rhizome system) beyond the perimeter of the area that you have covered with a tarp or old carpeting. It is the plant's way of seeking the sunlight and water that you have been depriving it of. While it is possible to remove these stray shoots organically, by far the easiest way to deal with them is to spray them with herbicide. Spraying is also the most effective way since the rhizome system will distribute the herbicide throughout the whole underground area that the weed is living in. 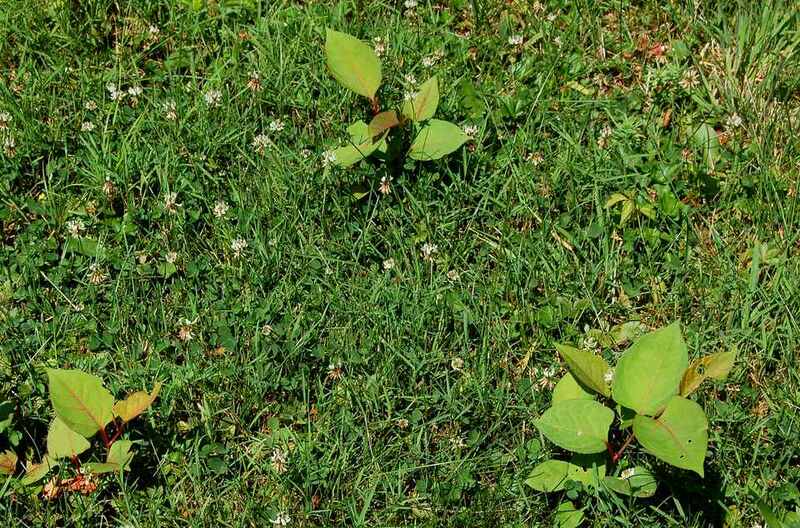 One spraying will not finish the job, but the combination of periodic applications of herbicide (as needed) and choking the weed out with the tarps or carpeting will eventually take its toll on the Japanese knotweed. The only possible way to keep this weed-control project entirely organic is to sink a barrier down several feet into the ground, all along the perimeter of the tarps. This is an approach that you will be familiar with if you have ever tried to contain bamboo plants with a barrier. Can't Get Rid of Japanese Knotweed? Harpoon It!